The plug-ins that come with Logic are very usable when it comes to mastering, however I tend to favour a mix of outboard analogue eq and light compression with in-the-box final eq. 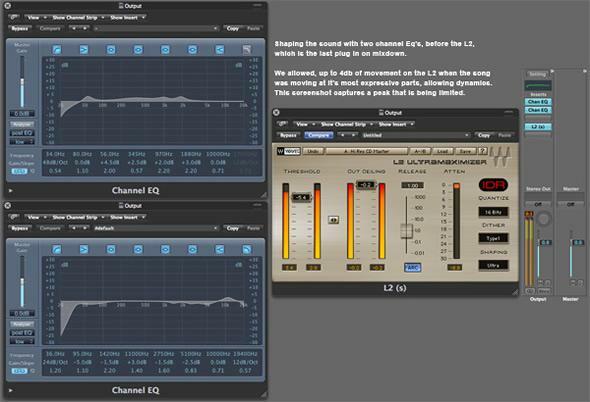 Waves L2 ad-limiting on the master out's, in addition to using temporarily, the visual side of the Logic Match Eq . What is it and how can it help me with Mastering in Logic Pro Audio? When it comes to mastering in Logic Pro Audio, there is a handy reference tool at your fingertips. 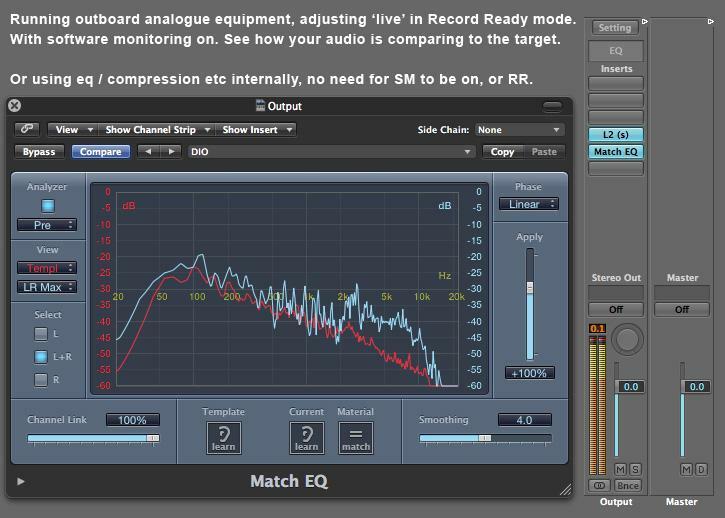 Although I do not actually use this tool to 'match eq' by implementing the complete procedure, I use this plugin as a reference to then adjust my channel eq to suit the curves. The recently mastered album 'New War' by Stuka Squadron is what we will use as an example.. Listening to Iron Maiden, Motorhead and Dio, we settled on a Dio track as a suitable target.. (shown in template pic). To analyse the chosen file, first boot up, on your stereo out channel, the Logic Match eq plugin. Move Logic to the side, showing your desktop. Find the audio file (which you have converted to the sample rate you are working at in your mastering session). When you have the file in a window and Logic in another. Click back on Logic, then literally drag the file onto the red Template icon on the bottom of the Match eq Plugin. You should now see the eq curves from that file. Save this as a template setting. 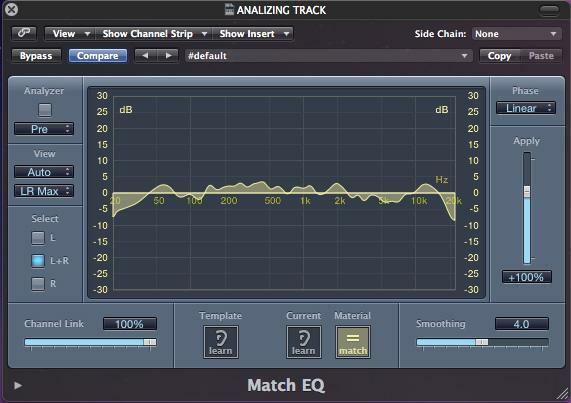 Bearing in mind that this finished track has already been mastered, it is important that the match eq is preceded by an ad-limiter such as the one in Logic or we use Waves L2. If you were going to hear and or use the Match eq as intended to process your audio you would use it before the Limiter. We want to see it working over the limited audio, this is why the Match Eq comes last in the chain. While running your track and listening, create up to 3db of limiting, add makeup gain until it feels right but is not crushing all the dynamics. Go to the Match eq with the template showing, and 'view' on template, click the Analyzer button, now you can see how your track is shaping up. 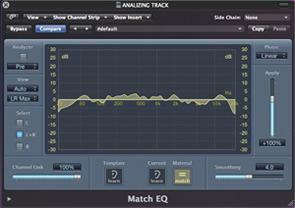 Add an eq to your un-mastered track channel and adjust this to try and give your track similar eq curves. When you think you're getting close, and you've A-B'd what you're getting with the original track (just go to the open window where it is and hit your spacebar), this is where your ears are judging too!. They sound pretty similar? then completely remove the Match Eq plugin from the Stereo out channel. Now bounce your track. Next, select any free channel (this is just for reference again) and open a Match Eq, then select your template. As before we are going to get your bounced track from it's location on your machine and click on Logic then swoop it onto the 'Current Learn' icon at the bottom of the Match eq. You need to kind of swoop these files onto the Match eq icons, clicking them or just dragging them in will probably create a new track, which we don't want! At this stage both red and green icons in the plugin are lit indicating that they have files ready. Next press Material = Match. This shows the difference between the template file and the new bounced file.. So you could either start the process again with your eq, or add another channel eq below the last one on your un-measured track channel, drawing in the difference you can see in the Match eq. Make a Template by dragging a file from a mastered CD onto the Template icon. Bounce your track out and then drag it onto the Current Learn icon. between the two audio files. Final audio file compared, following eq below. Close enough, works well, sounds great. Again back to using your ears… A-B with the chosen audio master, getting closer?.. Ideally, you want to use as little eq and plugins as possible, unless you are modelling something very particular. So if the track's been mixed by you and handy to get to, then why not save your eq modifications as something or take a screen shot of them.. Go back to your original mix and see what can be done to the offending instruments to make less of an eq (which is over the entire mix) modification when it comes to mastering. Also you may wish to consider compressing or adjusting levels on certain instruments, vocals and elements.. Whatever makes the mastering go smoother with less processing. When mixing a track don't add anything to the stereo buss such as compression or eq and make sure there is plenty of headroom. Your main content could be at -8 dB with flicking peaks at -3 dB, this gives the mastering engineer an ideal file to work with. At Metech, when mastering we use outboard analogue eq and slight analogue compression, running software monitoring to allow us to to run 'live' through the match eq. Generally we go out and back in at 24bit 96kHz. Having used these methods for some time it's a lot easier now to find a great curve to suit most music, using the analogue gear, with some minor tweaks in a final channel eq before hitting the L2 and 16bit dithering for the final file. Now, that's a general rule where we have recorded the material or the mixes sent to us are of a decent standard. If a poor mix has been supplied or there is obvious 'bass issues' or other problems we may resort to various plugins to clean things up. Logic has a handy function for use when recording musicians live. The plugins in Logic Pro are very useable. Check out Match Eq.. Ever wondered how they get that pumping sound in dance music?